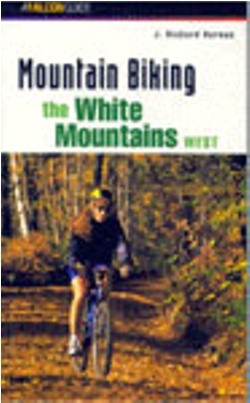 Mountain Biking the White Mountains West, by J. Richard Durnan, 1998. This compact Falcon guide serves up 46 of the best mountain bike rides in the western White Mountains - Lincoln/Woodstock, Thornton, Campton, Waterville Valley, Plymouth, Ashland, Rumney and Warren. There are a few easy beginner rides, but the emphasis is on more aerobically and technically challenging rides. Each trip has a map and detailed mileage log. Entertaining glossary, too. 182 pp, 4 �� x 7�.